Torchlight developer, Runic Games, is not a fan of SOPA or PIPA. The Seattle-based developer clarified its position after the issue came up on its official forum. "The question has been asked regarding our company's official position on the current SOPA/PIPA debate in Congress," said a Runic rep. "It is clear that the scope of the proposed legislation would give unnecessarily broad power to large corporations while reducing the rights of individual citizens -- and it won't even stop software piracy." "We at Runic Games oppose the SOPA/PIPA legislation and we encourage you to do the same." He went on to encourage gamers to contract their representatives and join the anti-SOPA community on Reddit. While Runic's decision to oppose the bill is brave, it's not surprising. It seems consistent with the developer's somewhat relaxed attitude towards piracy. "We got a lot of letters from people saying 'Hey, I pirated your game, but it was really cool, so I bought it,'" said CEO, Max Schaefer, in an interview last year. "Y'know, we're cool with that, we're not as concerned about that sort of thing as other companies, especially if it makes our honest players inconvenienced. We assume that everyone is an honest player, and we want to make their experience as cool as possible." PC hardware manufacturer, Nvidia, also recently came out in opposition of the bill, as did League of Legends studio, Riot Games. Runic Games currently only has one game under its belt - the excellent Torchlight. 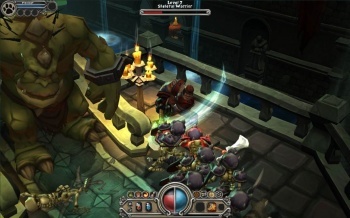 The much-anticipated, Torchlight 2, was delayed back in November of last year.